First there was One. There was no peace, because there was nothing with which to make peace. There was only One. Then there was Two. There was diversity. From this point on, an infinite cacophony of conflict extended in all directions and forever. And on the third day G‑d created peace. Peace is not homogeneity. Peace does not mean that everyone thinks the same way. 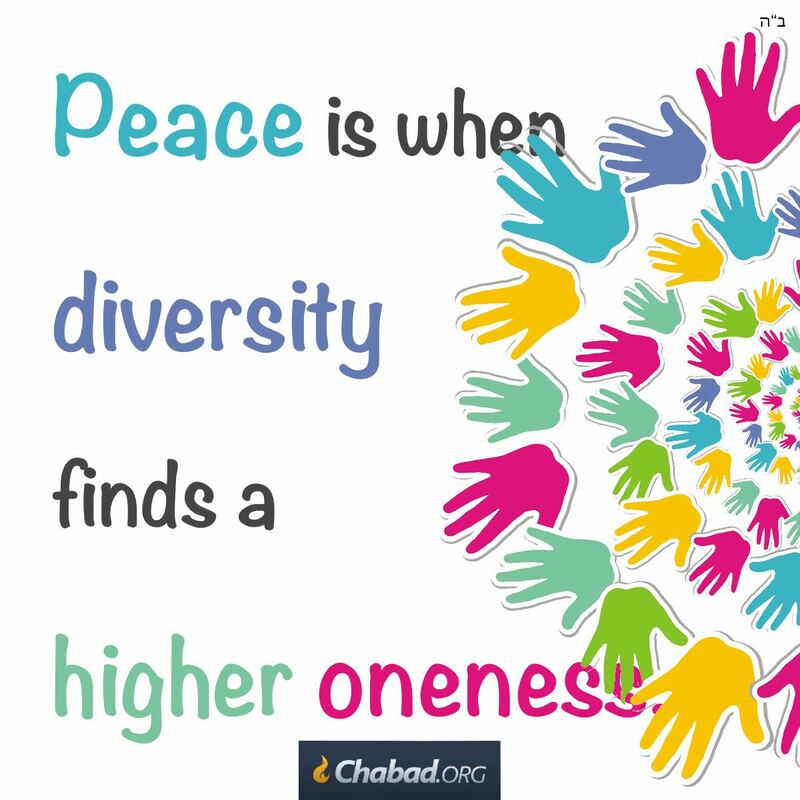 Peace is when there is diversity that finds a higher Oneness. From the wisdom of the Lubavitcher Rebbe, of righteous memory; words and condensation by Rabbi Tzvi Freeman. Subscribe and get your dose daily. To order Rabbi Freeman’s latest book, Wisdom to Heal the Earth, click here. Rebbe means teacher. Rabbi Menachem M. Schneerson is seventh in a prestigious line of chassidic rebbes. Even after his passing, he is known worldwide as simply "The Rebbe"- a Rebbe for any person in the world. This book offers every person a taste of the Rebbe's wisdom, condensed from over 50 years of letters, public talks, private conversations, and written works. Presented in an accessible format. Creating Peace Between us The mechanics of making peace depends on two parameters and the hidden constant! '1' is provided by our natural will to force things to work in my favour. '2' is provided by the divine spark awakened in me, Ohr (Light) Hassadim. This is the intention to favour others.